This was an Amateur Theatrical Production put on by Members of the Hildenborough Institute at the Drill Hall in Hildenborough. The first performance was on Wednesday January 27th 1904 and repeated on the Thursday and Friday. The Company was a large one, and was directed by Mr. George Johnson as Stage Manager, assisted by Mr. Charles Crowhurst. In addition to being the Stage Manager, George Johnson also painted the scenery. The Stage Carpenters were Mr. E. May and Mr. A. Hodge. The Characters themselves were:- Hickory Chains (the Miser) played by George Ingrams, with other parts played by Messrs. George Gray, F. Marriott, A. Killick, R. Killick, J. Rich, P. Ingrams, C. Cheeseman, W. Burgess, J. Macey, A. Goldsmith, and R. Neale. Or to put it another way, by several cricket-ball makers, a grocer’s assistant, a blacksmith, a blacksmith’s improver, an engineer, a rural postman, a waggoner’s mate, and a gardener’s boy! It was written by Mr. Dagney Major and Mr. John Johnson and received excellent reviews in the Daily Mail and the Daily Chronicle. The orchestra was composed of Mr. Scott on piano, Messrs. W. Chisholm, M. Morris, D. King, and W. Woodhams on violins, with F. Martin on cello. An original drama, played by villagers, in a village, is something to thrill even the hardened playgoer who gapes in a West-end stall and longs for something new. There are such sublime possibilities in it – possibilities of humour, pathos, passion, and Heaven knows what else, all worked up in a rural nutshell, and all manufactured on the spot. Such a thing happened in the pretty Kentish village of Hildenborough, near Tonbridge, last night: and the history of English drama was enriched by another and an entirely novel chapter accordingly. The gusty rain and the roaring wind did their worst to mar the entertainment – and their worst was nothing. The play was a great success, and when it was all over, authors and actors went to bed supremely happy. For weeks past Hildenborough has been eating and drinking and sleeping and thinking drama: and that drama has been ‘The Miser’s Bargain’, written by Mr. Dagney Major and Mr. John Johnson, 2 local celebrities, whose literary collaboration ought to bring them more than village fame some day. ‘The Miser’s Bargain’ is unique in that it has no ladies, and consequently no love interest in it. It is a stirring tale of smugglers who ran rum and riot on the coast of Kent in the 18th Century, and its uniqueness was enhanced last night by the fact that every member of the cast was a working man of Hildenborough. The reason why cricket-ball makers predominate in the cast is not because this industry breeds Thespian artists any more than grocery does, but because Hildenborough is one of the nurseries of the cricket-ball. The management hopes to enter on a second season next year when Messrs. Dagney Major and John Johnson will present a new play. 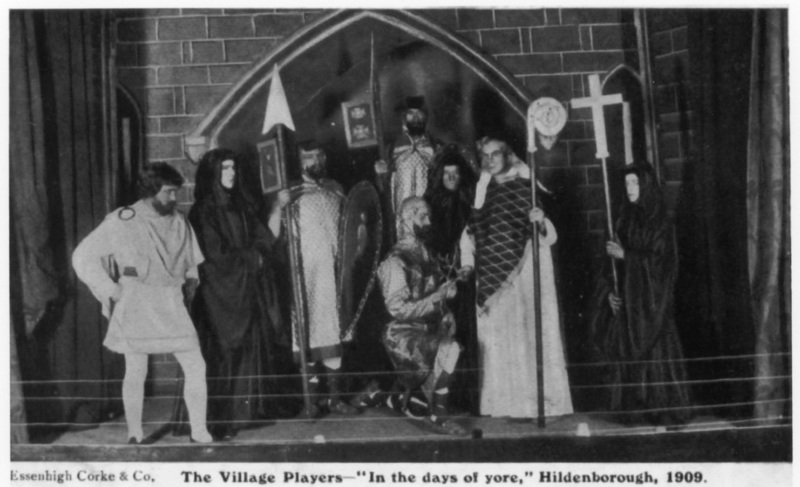 The play was first produced at Hildenborough where it ran for 3 nights, then went on tour to Chiddingstone Causeway. Then on to their most important engagement at Tonbridge Town Hall where they played to a crowded house and received most enthusiastic applause. The whole undertaking is a labour of good fellowship and the profits will be divided among local charities. It is sincerely hoped that other villages will copy Hildenborough’s example, and amuse themselves and their friends in this delightful and profitable manner”. “Scraggs” Killick (one of the actors) was a cricket-ball maker at Hitchcock’s cricket-ball factory in Mount Pleasant and was one of the best-known characters in the village at that time. “The Hildenborough play is now widely known, and the French, German and American press have reported on it. The Play, according to custom, has been designed for male characters only, but in anticipation of it being required for the London stage, the authors are preparing another version, one in which female characters will be introduced. Other places are following Hildenborough’s example, and another play by the same authors (The Luck of the Brians) will be performed this season at Norbury and Towcester”. 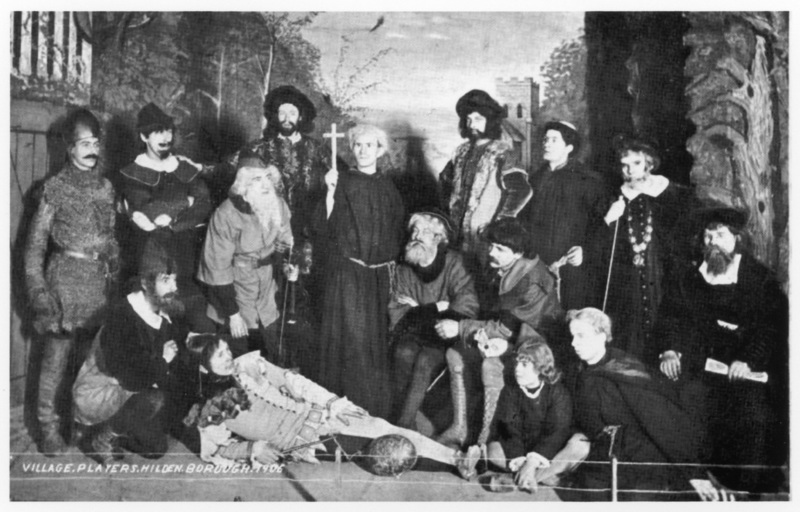 Following the success of ‘The Miser’s Bargain’ in 1904, the Village Players performed ‘The Luck of the Brians’ in 1905, ‘The Pilgrims Rest’ in 1906, ‘Back to the Land’ in 1907 and ‘Enemies’ also in 1907, ‘In Days of Yore’ in 1909, and ‘The Gentlemen from London’ in 1910. “The Play ‘The Luck of the Brians’ has been reviewed in this newspaper despite being written and performed in Hildenborough, Kent in the UK, but was about a melodrama set in California”. ‘The Luck of the Brians’ was reviewed in the Indianapolis News in Indiana as:“…… a remarkable stage production” and was also reviewed in the Kansas City Star newspaper in Kansas City, Missouri, and also in the London St. James Gazette on Jan. 23rd 1905. Many thanks to David Hunter who researched this subject and collated the above information.